10.11 Infantry units have a movement factor of three in Europe and two in the Pacific and move without impairment even if only supplied from a limited supply source or if suffering from army oil effects, although their CTL is reduced by one (30.522A). 10.12 Western Allied mechanized infantry have a movement factor of four in Europe and may conduct overruns in conjunction with armor units (13.5). Mechanized infantry units that have their mechanized component temporarily negated by supply problems (30.522B) or army oil effects have their movement factor reduced to three and may not conduct overruns. In the Pacific, mechanized infantry are treated as regular, non-mechanized infantry units for all purposes, have a movement factor of two and may not conduct overruns. 10.13 Infantry units attacked by exploiting armor incur a -1 DM unless they are defending in a capital, objective hex, IC, bridgehead or railhead (15.33A). 10.21 Replacements represent training organizations feeding new levies into combat units. One of their main functions is to provide players with cheap units which they may eliminate when subjected to attrition combat. 10.23 Replacements have one combat factor when defending against enemy offensive attacks. They may not engage or participate in offensive operations, including sea transport or seaborne invasions; are not counted toward the attacker's attrition totals; may not advance to occupy a hex gained by attrition; and have their CTL reduced by one by partial supply (30.522A) or army oil effects. 10.24 Replacements attacked by exploiting armor incur a -1 DM unless they are defending in a capital, objective hex, IC, bridgehead or railhead (15.33A). 10.25 All replacements begin the game in play and are placed on the board during the opening setup. Replacement force pools may not be increased. 10.26 Each replacement costs one BRP to rebuild. 10.31 Armor units consist of an infantry component and a mechanized component. This mechanized component gives armor units unique abilities, such as a ZoC, a greater movement factor and the ability to conduct overruns, create breakthroughs and move and attack during exploitation. 10.32 An armor unit may have its mechanized component temporarily negated because of supply problems (30.522B), army oil effects, or because it enters a jungle, mountain, swamp, forest or jungle/mountain hex in the Pacific theater (EXCEPTION: Japanese armor units in jungle hexes retain their mechanized component). When this occurs, the armor unit acts as an infantry unit, with a movement factor of three in Europe and two in the Pacific, has no ZoC, and may not conducts overruns, create breakthroughs or exploit until its mechanized component is restored. Its combat factor is unaffected, although armor units which have their mechanized component negated incur a -1 DM in the same manner as infantry units attacked by exploiting armor and are subject to a -1 DM when attacked if their CTL is zero or less unless defending in a capital, objective hex, IC, bridgehead or railhead; or in their home country. 10.33 Armor units which lose their mechanized abilities due to army oil effects remain in automatic supply if they exploited in the previous turn (30.551A). If the movement allowance of exploiting armor is reduced by winter effects, exploitation movement in an unaffected area is not counted against the reduced movement allowance (see the 13.47 and 16.39B examples). If an armor unit uses up its entire infantry movement allowance at any point during the movement phase and is in a location where its mechanized abilities are negated, it cannot move further. EXAMPLE: An armor unit in the Pacific theater (a movement factor of three) which moves into a mountain hex cannot continue its movement into a clear hex in the same turn, as moving into the mountain hex uses two movement factors and being in the mountain hex reduces the armor unit's movement allowance to two. If the armor unit began its movement in a mountain hex and moved into a clear hex, its full movement allowance would be restored and it could move into a mountain hex. B. Across impassable or all-water hexsides, including all-water hexsides containing crossing arrows. C. Across enemy fortification or fortress hexsides. D. Across rivers or into jungle, mountain, swamp, forest or jungle/mountain hexes in the Pacific theater (only - ZoCs extend across rivers and into rough terrain in the European theater). Although Japanese units may move through jungle hexes as though they were clear hexes, Japanese armor units do not exert a ZoC into jungle hexes. This reflects the quality of Japanese tanks as much as the difficulty of armor operations in jungle. 10.342 ZoCs extend into clear and European rough terrain and through friendly fortress and fortification hexsides into adjacent clear hexes, across European rivers and canals, and from clear-weather hexes into severe-weather hexes. 10.343 ZoCs adversely affect enemy movement (13.41D), unit construction (27.44) and supply lines (30.321). Russian armor units adjacent to Axis-controlled hexes at the start of the Axis player turn have no ZoC. 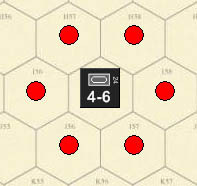 Russian armor units which are not adjacent to Axis-controlled hexes cause Axis ground units to expend only one additional movement factor to leave a hex in their ZoC or to move from one such hex to another, rather than the normal two additional movement factors. During exploitation movement, the ZoC of Russian armor units impairs Axis movement normally. A. SIZE: Each specialized unit consists of one factor. B. FORCE POOL ADDITIONS: Apart from starting units, specialized units are added to force pools only through production (42.24B; EXCEPTION: The Chindit may be created from three Indian infantry factors - 10.65A). C. BRP COST: Each specialized unit costs three BRPs per factor to build. D. CONSTRUCTION: Specialized units may not be rebuilt in the player turn in which they are eliminated. E. STACKING: Up to three specialized units may stack in a hex, regardless of the presence of any other units or counters (12.12). Specialized units may both attack and defend in situations where another unit would be overstacked, even when they do not use their other special abilities, as where an airborne or Chindit unit is moved and used like infantry. (EXCEPTION: Airborne and Chindit units which are part of a seaborne invasion force may not overstack. Only two embarked ground units plus any number of marines and commandos may attack in an invasion. This does not prevent the use of an airborne unit in invasion combat by way of an airdrop, provided the requirements for an airdrop are met). F. DEFENSE: Specialized units are not subject to a -1 DM when attacked by exploiting armor (15.33A) or as a result of winter effects (34.41). 10.42 Specialized units which are not fully supplied or subject to the army oil effect retain the attributes listed in 10.41A-F, but may not airdrop or conduct seaborne invasions. 10.51 SPECIAL ABILITIES - AIRDROPS: Subject to the restrictions set out below, an airborne unit has the special ability to airdrop. Airborne units may also be air transported. 10.52 AIRDROPS: Airdrops may be made only during the combat phase, and are announced and resolved either immediately prior to ground combat resolution or immediately prior to exploitation combat resolution, whether or not any breakthrough or exploitation movement by armor units occurred. A. BASING AND AIR TRANSPORT REQUIREMENT: An airborne unit may only airdrop from an operational air base which contains an uninverted air transport factor at the time the airdrop is made. The airborne unit may move to the air base and the air transport factor used may stage to the air base during the movement phase of the player turn of the airdrop. The air base need not have been fully supplied at the start of the owning player's turn, provided it received full supply during the owning player's initial supply determination. Airdrops may be made from an airbase placed during the movement phase. B. OTHER ACTIVITIES: An airborne unit may not airdrop if it is air or sea transported during the movement phase, or if it attacks or invades by sea during the combat phase. C. OFFENSIVE OPERATION REQUIRED: An air transport factor which participates in an airdrop is conducting an offensive operation. An airborne unit which airdrops is conducting an offensive operation if the hex into which it drops contains an enemy ground unit and ground combat occurs as a result of the airdrop (9.42A). D. COMBAT TRAINING: Airborne units may only airdrop if they have a CTL of two or more. E. WEATHER: Airdrops may not be made by airborne units into a hex subject to a winter effect of 3 or greater. Airdrops may be made from a hex subject to restrictive winter weather, but not into a hex subject to restrictive winter weather. Airdrops may not be made from or into swamp, jungle, or jungle/mountain hexes subject to a monsoon (34.24B). 10.54 INTERCEPTION BY DEFENDING AIR UNITS: Airdrops may be intercepted by eligible defending air units, which in turn may be counter-intercepted by eligible attacking air units. If the air transport factor carrying the airborne unit is forced to abort, the airborne unit returns to base with the air transport factor. If the air transport factor is eliminated, the airborne unit is also eliminated (18.624). A. LIMITED TO DROP HEX: An airborne unit which airdrops may only attack units in the drop hex itself. It may not attack units in adjacent hexes, either alone or in conjunction with other attacking units, even if the airborne unit drops on an empty hex or a hex occupied by friendly units (EXCEPTION: Multi-hex attacks - 10.55B). B. DEFENDING UNITS IN MORE THAN ONE HEX: If defending units in two or more hexes are being attacked in a single attack (15.44), an airborne unit may participate in the attack by airdropping on any of the attacked hexes. C. AIRDROPS LIMITED TO 1:1 ATTACKS OR GREATER: An airdrop onto a hex containing an enemy unit may only be made if the first round of the resulting ground combat is at 1:1 odds or more. This restriction does not apply to subsequent combat rounds. D. DEFENSE AGAINST INDEPENDENT AIRDROPS: Infantry, replacement and partisan units defending only against an airdrop, without being attacked by other enemy ground units, receive a +1 DM; armor and specialized units received a +2 DM (15.32H). E. CUTTING WATER DEFENSES: An airdrop made in conjunction with a cross-water attack negates the defender's +1 DM for the river or crossing arrow (15.32C). 10.56 MOVEMENT FOLLOWING AIRDROPS PROHIBITED: An airborne unit may not advance after combat or voluntarily move from the hex on which it airdrops, except by redeployment, until the game turn following its airdrop. An airborne unit in the same hex as an enemy unit after combat is eliminated. 10.57 NO AUTOMATIC SUPPLY: Airborne units are not automatically supplied during the game turn following an airdrop, even if dropped during exploitation. 10.58 NO EFFECT FROM ZoCs: ZoCs have no effect on airdrops. A. The Chindit is considered to have an inherent airdrop capability and does not require an air transport to conduct airdrops. Otherwise the Chindit is subject to all normal airdrop restrictions (10.53). B. If the Chindit’s inherent air transport factor is forced to abort, the Chindit returns to base; if it is eliminated, the Chindit is also eliminated (18.624). C. The Chindit may not airdrop on a hex occupied by an enemy ground unit. D. The Chindit may not move or attack in the combat phase in which it airdrops. 10.62 SUPPLY: The Chindit is always automatically in at least limited supply. 10.63 MOVEMENT: The Chindit does not expend an additional movement factor to enter jungle hexes, although it must expend an additional movement factor to enter jungle/mountain hexes. A. Enemy units incur a -1 DM if attacked by the Chindit, provided the Chindit is in a hex which does not contain and is not adjacent to any other Western Allied ground units (15.33H). B. The Chindit may occupy a jungle, but not a jungle/mountain, hex by attrition advance (14.62D). A. CREATION: The Chindit may be created by normal production (42.24B) or by converting existing Indian units. Three Indian infantry factors are permanently removed from the British force pool; these units may be on the board or unbuilt. The Chindit is then added, unbuilt, to the Western Allied force pool. B. CONSTRUCTION: The Chindit may be constructed in any eligible Indian hex or in the India box. The BRP cost of constructing the Chindit counts against the British, but not the Indian, construction limit (27.474D). Construction of the Chindit prior to the outbreak of war between Britain and Japan does not affect USAT. 10.66 GEOGRAPHICAL RESTRICTIONS: The Chindit may only be used on the Southeast Asian front on the Pacific mapboard. The Chindit may be produced and constructed prior to the outbreak of war between Britain and Japan, but the Chindit may not leave India until the outbreak of war between Britain and Japan. 10.71 SPECIAL ABILITIES - INVASIONS: Enemy units attacked during a seaborne invasion do not receive the +1 DM usually associated with units defending against invasion (15.32B) if at least half the ground factors engaged in invasion combat are composed of American marines or Japanese Special Naval Landing Forces. Units attacking by land from hexes adjacent to the invasion hex, airborne units dropped on the invasion hex, and invading units which do not take part in invasion combat, including armor units held in reserve for exploitation, are not counted in making this determination. 10.72 OVERSTACKING DURING INVASIONS: Marines are not counted towards the stacking limits when conducting seaborne invasions (21.517A). 10.81 SPECIAL ABILITY: Commandos may conduct seaborne invasions against any undefended port hex. The range of an invading commando unit is restricted to 10 (Europe) or five (Pacific) hexes (21.512A). Ports which contain enemy ground units at the start of the Allied combat phase may not be invaded by commandos. This does not permit seaborne invasions of otherwise ineligible ports by non-commando units. A bridgehead may not be placed in a port invaded by a commando using this special ability. 10.82 OVERSTACKING DURING INVASIONS: Commandos are not counted towards the stacking limits when conducting seaborne invasions (21.517A). 10.83 CTL REQUIREMENT: Commandos may not utilize the special abilities set out in 10.81 and 10.82 unless the Western Allied CTL is two or more. 10.84 CONTRASTS WITH MARINES: Commandos do not negate the +1 DM received by ground units defending against a seaborne invasion. 10.91 Flak units represent anti-aircraft artillery. Their only function is to combat enemy air attacks and strategic bombing. 10.92 Flak units have a movement factor of one. 10.93 Flak units have no ground combat factor, may not engage in offensive operations, are not counted toward attrition totals, may not be taken as attrition losses, may not advance to occupy a hex gained by attrition, and are unaffected by partial supply (30.261) or oil effects. 10.94 Flak units are eliminated if their hex is occupied by enemy units. 10.95 Each flak factor increases the air defense and SW combat defense level of its hex by one. 10.96 Up to three flak factors may stack in a hex (12.12). 10.97 Flak units are generated by military production (42.24A). 10.98 Each flak factor costs one BRP to build. 10.99 Each flak factor is considered to be one ground unit for SR purposes (28.62).